Join us in kicking off our 10th Anniversary weekend celebration with an a la carte pizza & wine reception at the Fort William Henry Resort! Three uniquely-crafted pizza options will be featured on the menu, along with coordinating Adirondack Winery wine pairings! Check out our website for menu information updates! Gather up your friends… it’s time for a fun and crafty afternoon at the Adirondack Winery Bolton Landing Tasting Room! Help us celebrate during our “Cheers to the Years” 10th Anniversary weekend by joining us on Saturday, April 14th to sip on a wine tasting flight and snack on a light food spread as you get in touch with your creative side! Our friends from Wax n’ Wix will be there to guide you through making your very own pair of special edition 10th Anniversary wine glass candles! Pick from a selection of fun wax colors, arrange a unique pattern and then choose your favorite scent for your 2 candles that you get to take home with you! Seats are limited – reserve yours today! ALL varietal wines are on the shelf. Wines made from the grapes – marquette, frontenac, marechal foch, la crescent, lacrosse – grown in the Easton vineyard are now available. Enjoy a wine tasting of 8 wines for $5 and keep the logo-etched souvenir glass. A glass of wine of your choice is $5. Also, 10% discount on ½ case (6 bottles) and 15% discount on a 12-bottle case of wine. Winery and vineyard tours are free. The 2018 opening line up of eight wines includes three white wines and 5 red wines. All wines are crafted from grapes grown in the onsite vineyard. Taste the distinctive wines of our region crafted exclusively with grapes grown right here in New York State’s newest wine region. It’s been a decade since Mike and Sasha Pardy celebrated their grand opening of Adirondack Winery in Lake George. Ten years later, they’re about to celebrate their milestone 10th anniversary – and invite you to join them in a celebration of 10 years of fantastic wine and experiences with customers like you! Join us for our centerpiece of the weekend’s festivities – an Amazing five-course wine dinner that is both infused with and paired with your favorite Adirondack Winery wines! Make the most of your weekend with us with events at both our Lake George and Bolton Landing tasting room locations, featured food and drinks at the Fort William Henry, and so much more in between! Tickets are on sale now! Sit back and relax as the Chef and Winery staff introduce each course and share their inspiration for each dish and pairing. The dinner will feature five unique dishes, both prepared and paired with carefully selected Adirondack Winery Wines to sip and savor while you enjoy each course! Join us in wrapping up our 10th Anniversary weekend celebration with an a la carte Wine-Infused Breakfast Buffet at the Fort William Henry Resort! Three unique wine-infused breakfast options will be featured on the menu, along with 2 delicious breakfast wine cocktails! Join us for the most relaxing part of our entire event! We invite you to join us on Sunday, April 15th from 10-11am on the lawn of the Fort William Henry for a rejuvenating start to another day of celebration! Hit refresh after a fun and eventful Saturday evening at our Cheers to the Years Wine Dinner by joining us out on the lawn Sunday morning for a relaxing and restorative yoga experience! 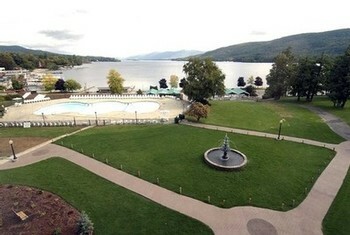 This all-levels session, guided by local yogi Nicole Woodcock, will allow you to focus on the linking together of movement and breath while enjoying the beautiful backdrop of Lake George. After stretching out lake-side, be sure to round out your morning with a round of breakfast cocktails for you and your friends! Stop by our Wine-Infused Breakfast Buffet going on from 7:30am-12pm for specially featured breakfast items & breakfast cocktails, all prepared with Adirondack Winery wines!